On the 2nd of September 1985 Kimberley Ann joined us and now 21 years later we get to say a big Happy Birthday! Just as she will this weekend, Kimberley had a lot of fun growing up, and in a number of ways my life would have been very dull had she not come along. From drawing all over mirrors with lipstick to chatting up policemen at my hens night, Kimby has made sure that there is a little bit of cheekiness in all that we did. I want to take the time on her 21st birthday to let her know how proud I am of her and her many achievments. She has come so far in 21 years and has been a true and treasured blessing to Simon and I, both as a sibling and a friend. We wish we there to celebrate with you and we know you will have a wonderful time! 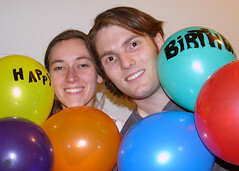 Oh and a word of advice from your big sister – let mum blow up the balloons! Given my usual blogging activity some of you maybe wondering what has happened to me and my little excursions. Well I have left Simon in Calgary and have gone to Toronto! Author GemmaPosted on August 29, 2006 Categories Calgary1 Comment on Where's Gemma? 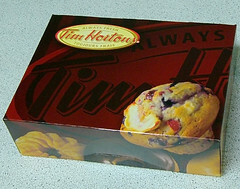 The Canadian equivilant of Krispy Kremes, Tim Hortons is a bit of an icon here. Ever since our first day on the Moose bus on-route to Whistler we have been told that it is in one of ‘Timmy’s’ stores that you really experience Canada. Miles Gilbert ‘Tim’ Horton was a Canadian Hockey player born in 1930. In 1964 he opened his first coffe and donut store, but it wasn’t until a friendly policeman walked in (a cop that likes donuts??) and offered to become partner that things really took off. There are now over 1500 stores across Canada. Sadly though, Mr Horton never lived to see any of this success as he ran himself off a road in his exotic sportscar in 1974. The jolly ex-policeman has since sold the chain to American Hamburger chain Wendys. So how are the donuts…. Well I’m writing home about them so they must be good. The coffee is pretty terrible though. Lougheed HouseOriginally uploaded by simmogem. After a brief rest from excursions I was back on the case today, and what a marvelous gem Lougheed House was. 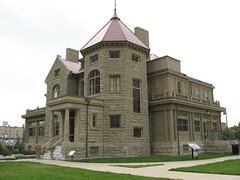 The home was built in 1891 by Sir Lougheed and his wife Lady Isabella, with the restoration only completed last year for Alberta’s centennary. There is too much to tell of the history of the house, but briefly, after Sir and Lady Lougheed died in the late 20’s, early 30’s, the house was lost from the family during the depression. It was later used by the Canadian Women’s Army Corp (CWAC) as its Currie Barracks and then by the Red Cross. After the Red Cross moved into a larger premises next door the house lay empty for fifteen years until the Historical Society of Alberta approached the City to discuss restoration. Much of the home, despite being neglected for some time, remained in tact. There is another photo of a stained glass window, one of many, that was shipped from the east coast when the house was originally built. The front windows are the original hand blown panes and the walls have been repainted using colours from the Calciminers Handy Book, a 1907 manual on wall finishes popular for commercial and residential buildings as far back as Pompeii. There is also some of the original furniture and an exhibition on the CWAC. To say that my exploration of Lougheed House was a treat would be an understatement, I was there almost three hours soaking it all in. I must admit it was not the same without you Reado! I dare not venture past the staff only barriers as you would have. But like all our forays into history I did partake of coffee and cake in the dining room and I acquired a copy of the Lougheed House history so I can show you some particularly fine hinges. Whilst Neil Perry might not serve this up, the Hummingbird’s recipe for Cornflake Chicken was a mighty succes in this Lawrence household. A bit of lemon pepper seasoning to the cornflakes was all that was needed for this easy and scumpious dinner. The Hummingbird has out done herself and I shall be adding this to the family favourites cookbook. Those concerned it maybe a little dry need not worry, the chicken was moist and tender (but this may have been the cook – Simon). The recipe can be found under our blog on Cornflakes. 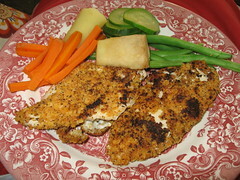 Author GemmaPosted on August 22, 2006 Categories Calgary1 Comment on Hummingbird Chicken a success! After Brain’s demands for new topics we thought we would pick something that suits him to a tee – being an ex panel beater and all. Ever since landing in Canada we have been amazed at the state of some vehicles. The car pictured here is even registered and daily driven still. And people thought the Zed was a sorry sight when it was first purchased. 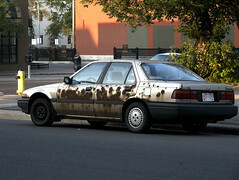 And while the Honda Accord here is probably a late 80’s model, it doesn’t take long for rust to begin here as new models are often seen with the tell tale signs of car cancer taking hold. A few weeks ago, as Simon graciously explained, I gave the community food store the flick. It didn’t take long before I felt inspired to give something else a go and here I am – a home design associate with Chintz and Co. Basically we sell everything and anything for home decorating. I work in the table top section, lots of dinner settings, glassware, napkins etc (For more info www.chintz.com). I have just completed my first week there and have enjoyed it – although my feet are killing me. Hard concrete and tile floors do not go well with heels! For those wondering where it is – our units are half a block to the left and Simon’s work is next door on the right. Its a small world we live in but come winter I will appreciate it.